in other artistic genres. Yet it is necessary to understand how the tradition of utsushi is seen within Japanese culture and how the utsushi created by those disciples contemporary to the master should be observed and judged. Kenzo Koga, who has written extensively on Japanese art, provides insight on how to understand the tradition of utsushi. He argues that utsushi promotes artistic creativity, in which a talented artist can emulate a work of art to a point where the viewer would not be reminded of the original piece. Additionally, some might be inspired by the style or forms of original pieces and incorporate certain designs or techniques used in the original into the artist’s own works.2In the world of netsuke, various disciples and artists would produce an utsushi of their master’s works not only to pay homage but also to present their level of skill, or even subtly to try to surpass their master. For artists living in the present, utsushi is a way to converse silently with masters of the past to understand the techniques used. Once contemporary artists are able to unlock the mysteries, then they are able to use that experience to create distinct works. However, it is different when masters create identical pieces since these are done for “commercial purposes.3Utsushi are meant instead to display the skills and creativity of an artist. One example that perfectly expresses the tradition of utsushi within the art of netsuke is a work done by the noted contemporary netsuke artist, Nakamura Masatoshi. 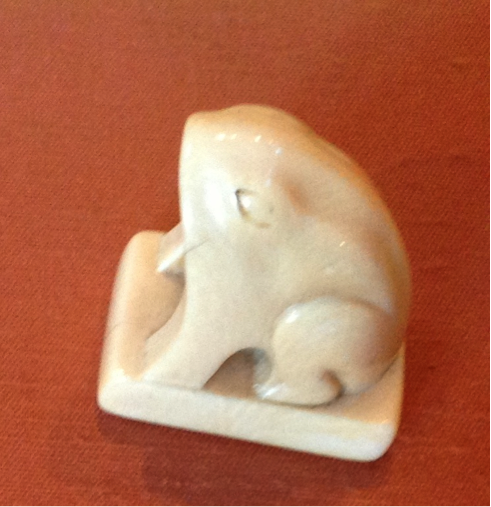 Ohara Mitsuhiro, a netsuke artist from the 19th century, first created a netsuke of a frog sitting on a base. Masatoshi then created an utsushi based on Mitsuhiro’s work.4 On the bottom of the netsuke, Masatoshi inscribed, 光廣原型、雅俊写 (transliterated: Mitsuhiro genkei, Masatoshi utsushi) or the original form was created by Mitsuhiro and an utsushi was made by Masatoshi. In Raymond Bushell’s book, The Art of Netsuke Carving, Masatoshi expresses that he had done an utsushi that is quite close to the original excluding the himotoshi,5 which was done by someone who owned the netsuke.6 Masatoshi carefully studied the original piece to understand Mitsuhiro’s style, but also took note of elements added later such as the himotoshi. This careful analysis is important for an artist to create an utsushi. It seems that not only is there a lack of discussion in understanding the philosophy of utsushi, but utsushi within netsuke has been assigned an unworthy status. Some have gone to the point of privileging different netsuke, where the original rates at the top while utsushi is given a secondary or tertiary rank.7 In reality, utsushi would not be part of the categorization, but something different. An utsushi of a netsuke may appear similar to the original, but when examined carefully, there are subtle differences from the original. It is rather incomplete simply to say that an utsushi is just “an antique carving made by a student for study purposes...”8 Students are not the only artists who create utsushi. Masters also make an utsushi of works produced centuries before to understand the skills used in various objects. Additionally, netsuke artists may be inspired by traditional Japanese performing arts and literature to render a character from a story or to refer to a scene or theme found in poetry or literature. An utsushi is not just merely “copying” a master for study purposes; instead the tradition requires artists to have mastery to produce an object and at the same time render a deeper understanding of Japanese performing arts and literature. Utsushi encompasses a rich artistic philosophy that promotes the continuity and development of an art form. The English term “copying” simply does not do justice to netsuke where the utsushi may surpass the original in subtle ways or the motifs might be inspired by an original netsuke. For now, further discussion and research on utsushi within netsuke is necessary to deepen the understanding of Japanese art and the appreciation by collectors. It is hoped that collectors and scholars would be rewarded with a more complete understanding of netsuke by appreciating the creativity that is involved within the tradition of utsushi. Students are not the only artists who create utsushi. Masters also make an utsushi of works produced centuries before to understand the skills used in various objects. Additionally, netsuke artists may be inspired by traditional Japanese performing arts and literature to render a character from a story or to refer to a scene or theme found in poetry or literature. An utsushi is not just merely “copying” a master for study purposes; instead the tradition requires artists to have mastery to produce an object and at the same time render a deeper understanding of Japanese performing arts and literature. 1Wertheim, Stanley. The Question of Authenticity. INSJ Vol. 28 No.4 pp. 27. 2 Koga, Kenzo. Utushi no Bigaku. Nagomi Sept. 1990 edition. Tankosha. pp.41-42. 3 Wertheim, Stanley. The Question of Authenticity. INSJ Vol. 28 No.4 pp. 27. 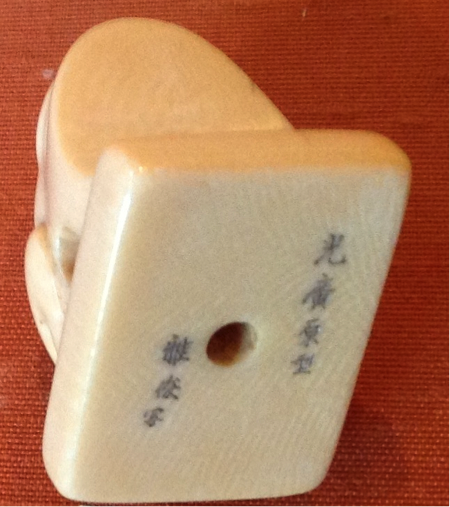 5A hole carved on a netsuke so that a string can pass through.